The creation narratives which form the opening chapters of the whole Bible are fundamental to the way we understand ourselves and our world in relationship to God. Theologians, saints, philosophers, artists and ordinary Christians have returned again and again to these first chapters of the Bible to examine and explore them and to find out what they show us about the Creator and the created world. At times misunderstood, or read in a very narrow way, they are masterpieces of theology, not expressed in the sometimes dreary terminology of the academy but in vivid stories accessible to all. The thumbnail image introducing this unit is Michelangelo’s sublime depiction of the Creation of Adam. Read more about it here. Chapters 1 and 2 of the book of Genesis contain the biblical accounts of the creation of the world and of human beings. All creation stories aim to explain how things came to be and why life is as it is. Hence the ‘history’ and ‘geography’ of the creation stories are figurative rather than actual. The narratives in the Bible provide answers to human questions about God, about the origin and meaning of the world and about human life, they are not intended to be scientific, historic or geographical explanations of our origins. Contrary to what many think, this is not an recent insight. St Augustine in the fourth century realised that the creation stories of Genesis were not scientific treatises. He taught that the whole purpose of the scriptures was to explain God’s plan for the world and its salvation, not to supply theories of natural science. There is no necessary conflict between the Genesis stories and scientific explanations of our origins such as the various theories of evolution. The first creation narrative in Chapter 1 is a majestic account of the creative work of God, at whose very word the whole universe is formed and ordered. The grandeur of the account transcends particulars of time (history) and space (geography). The whole cosmos is the imagined setting and the world within it is a ‘serene, beautiful world, in which all is ordered to humans and humans are ordered to God’ (The New Jerome Biblical Commentary pg 11). God pronounces creation and all it contains very good and gives human beings, created in the divine image, authority over the natural order. The second creation narrative is more ‘earth-bound’ and goes into further detail about human beings, their relationships and roles. God is imagined in rather an anthropomorphic way, and having fashioned ‘adam’ from the earth places him in a luxuriant garden watered by four streams. Two of these – the Tigris and Euphrates – are the names of the great rivers of Mesopotamia, a name which means ‘between the rivers’, where Abraham, probably the first ‘historical’ character of the Bible, came from. Mesopotamia is part of the fertile crescent popularly known as ‘the cradle of civilisation’. Read about ‘the cradle of civilisation’ in an article which enumerates many features of civilised life which first emerged in Mesopotamia. Other proper names mentioned in the creation account in Genesis 2, such as Pishon, Havilah, Gihon, Cush, cannot be related to any known geographic place or feature. The ‘geography’ and ‘history’ of Genesis 1 and 2 reflect ancient, rather than modern, understandings of the cosmos. The stories incidentally tell us a great deal about how the people of Israel imagined the physical construction of the cosmos, and their particular world view (Click on ‘OT Cosmology’ in side-bar). While this world view differs greatly from the scientific worldview we possess, this does not detract from the essential truth and meaning of the Genesis stories. For those who are interested, depictions and brief explanations of some other ideas about how the universe is organised can be found on a Library of Congress site entitled Beginnings, while a small collection of creation stories from around the world might be interesting as comparisons with the Genesis stories. Make a model or sketch to illustrate how the ancient Israelites imagined the cosmos was constructed. 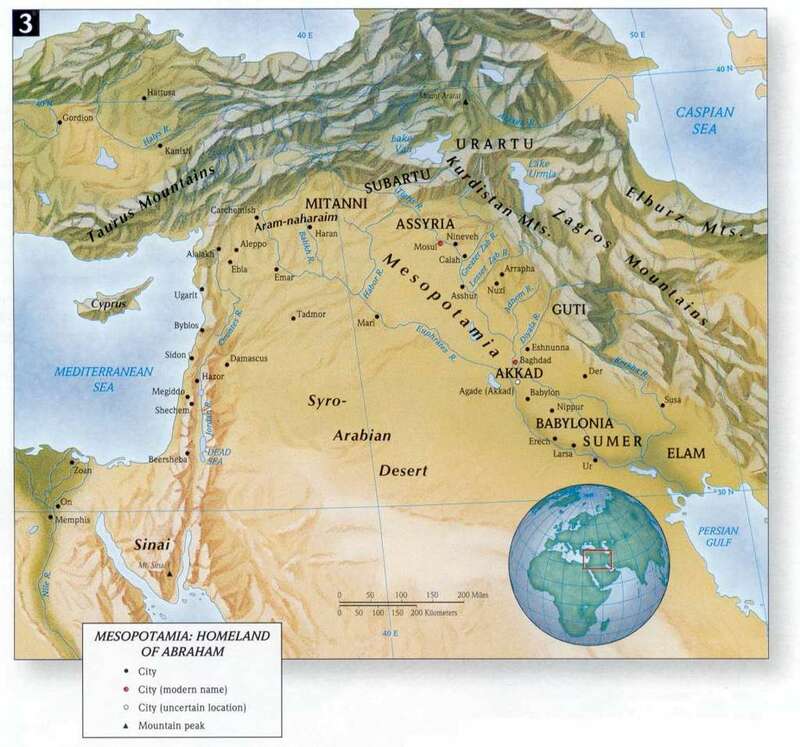 Find Mesopotamia on a map. Locate the Tigris and Euphrates Rivers and the city of Ur from whence the Bible says Abraham came. Mesopotamia is sometimes described as the ‘cradle of civilisation’. Can you explain why? Why might the authors of the second Creation account have mentioned the Tigris and Euphrates rivers in writing about human origins? Does the fact that the biblical accounts of creation are not historical/geographical/scientific accounts detract from their truthfulness? Why, or why not? Read a creation story from another worldview. List some similarities and differences between that story and the Genesis accounts. The creation stories have their origins in the oral history of the people of Israel. They are influenced by this people’s cultural background as inhabitants of the ancient near east, but primarily and most importantly by their experience of God at work in their history. The Cultural Context of Israel gives a good explanation of religious and cultural influences on Israel, and also explains how Israel’s experience of God in its history influenced the accounts of creation. This article includes a summary of the Babylonian creation myth Enuma Elish with which the Genesis Creation story is sometimes compared. This ancient text was composed long before the Genesis account and there are many similarities but also great differences between the two. ‘Genesis 1’ on Tony Watkins’ site provides an accessible explanation of why understanding the genre of the first chapters of Genesis is important in understanding its meaning. While traditionally Moses was regarded as the author of the Pentateuch, biblical scholarship has convincingly suggested that four ancient traditions, the Yahwist (J), Elohist (E), Priestly (P) and Deuteronomist (D), have shaped most of the text of the first five books of the Bible. They are the principal sources of the text of the Creation stories. Bible Dudes contains a brief and amusing summary of each of the sources, plus another couple of significant influences on the text of the Old Testament. The first chapters of Genesis contain two narratives of creation. Chapter 1 reflects the Priestly tradition and focuses on the majesty and power of God. Chapter 2 reflects the older Yahwistic tradition, and seeks to explain the relationship of human beings to God, to the created world and to each other. Especially the second account is etiological in its intent. That means that the narrative is written to explain why the world is as it is. It answers fundamental human questions about the meaning of human lives and the origins of sin and suffering. Genesis, Exodus, Leviticus, Numbers and Deuteronomy comprise the Pentateuch (the word means five books) which constitute the Torah or ‘Law’ of the Jewish people. A fuller explanation of Torah can be found on this Jewish site. How many creation stories are recorded in Genesis? How would you describe the genre of the creation stories in Genesis? Meaning in Greek ‘five books’, the first five books of the Old Testament are known as what? Many scholars of the Bible think that these first five books have four principal strands of authorship. Can you name them? Explain which author is probably responsible for Chapter 1 of Genesis? Which author is probably responsible for Chapter 2 of Genesis? Which Babylonian myth is often compared with the creation story in Chapter 2 of Genesis? As indicated in the previous section the creation stories in Chapters 1 and 2 of Genesis are editions of ancient stories. The narrative in Chapter 2 is the oldest story dating back to the tenth–ninth century BCE (Genesis 2) while the account of creation in Genesis 1 which opens the Bible dates to the sixth–fifth century BCE. This page gives a concise summary of the formation of the Torah including the main sources of the text of Genesis while a podcast explains something of the two accounts of creation in Genesis. The Yahwist narrative, in Genesis 2:4–25 probably had its written origins in Judah in the relatively peaceful times of Solomon, while the Priestly account, which forms Genesis 1, probably had its origins in the period in which Israel was in exile in Babylon. The priestly leaders, bereft of temple or king and challenged by the elaborate religious systems of the Babylonian empire, began to write down the religious intuitions and revelations unique to Israel in order to encourage and invigorate the faith of the people. Find a timeline of the history of Israel. Locate the approximate dates of the writing down of the creation stories on this. Why do scholars think that the Yahwist account of creation is the oldest? Why do scholars think that Genesis 1 may have its origins in the context of worship during the exile in Babylon? Read through the creation narratives in Genesis. The first account runs from Genesis 1:1 to Genesis 2:3, while the second account runs from Genesis 2:4 to verse 22. Chapter 3 of Genesis describes the Fall of Adam and Eve and the banishment from Eden. An NRSV translation indicates the priestly account by the use of a blue font and the Yahwist narrative in black. It includes a diagram of the earth as the people of ancient Israel would have imagined it. Read both creation accounts aloud. Notice the different performance requirements of each account, especially the rhythms and repetitions of the first, the ‘story-telling’ mode of the second. Read a couple of different translations of Chapter 1, noticing what is similar and what is different about them. Then do the same with different translations of Chapter 2. Prepare a slide show/PowerPoint presentation to accompany the telling of the first chapter of Genesis (including the first 4 verses of Chapeter 2). Read and listen to the account of creation in Genesis in Hebrew (an English translation is given beside the Hebrew) so that you can follow the reading and hear the poetry of this text. Can you find out the Hebrew for repeated words like ‘God’, ‘And it was so’, ‘And there was evening and there was morning, one day, a second day’ etc? The Creation stories set out to define the ultimate shape and meaning of our world. Firstly, they establish some essential ideas about the nature of God and the nature of God’s relationship to the created order, especially to human beings. Secondly, they explain some fundamental principles about the purpose and meaning of human life and relationships. The Narrow Gate site provides a point form introduction to the creation stories. Scroll down the Contents page to ‘Genesis – the primeval history’. A good interview with biblical scholar Sr Diane Bergant explores what the creation stories of Genesis teach us about God, about the dignity of men and women, about sin and about caring for God’s creation. Sometimes it helps to spell out some aspects of the Genesis creation accounts to see why they have been, and continue to be, key texts for an understanding of God, the universe and human beings. A summarypoints to some of these. Why are the creation accounts so fundamental to our understanding of God, the world, human beings and relationships? Note some similarities and some differences between the second creation account and Enuma Elish. What characteristics of the ancient stories of Genesis 1 & 2 have made them ‘living’ documents while the Babylonian stories have lost their religious significance? A helpful site for teachers of older students who want to familiarise themselves with the aim and method of biblical exegesis (a careful reading of a text to discover its meaning) is Richard Ascough’s A Guide to Biblical Exegesis. What did the author mean? Ascough suggests a particular way of going about answering these three questions. The first tasks in each section are well within the capabilities of middle-school students. Later tasks and terminology are more appropriate to senior and tertiary students. Hyperlinks within the text of the article direct teachers to a useful guide to different translations of the Bible and recommendations about various exegetical tools (concordances, dictionaries, commentaries, etc.) in print. Using Richard Ascough’s guide, prepare your own exegesis of Genesis 2:5–7, or Genesis 2:18–25. Younger students might complete a table called Comparing the Creation Stories in Genesis 1–2. The creation accounts suggest prayer centred on the wonder of the world and the place of human beings as the crown of God’s creation. The Catholic Conservation Centre is a site which contains an immense number of links to articles, church teaching and prayer in relation to ecology, the environment and the whole created order. Scroll through the site to find a large collection of prayers that relate to creation and the natural world. Worship Aids is a prayer resource from the Earth Ministries site. It contains quite a range of prayers and litanies that could be helpful in preparing classroom prayer around creation themes. As it is American in origin you might need to reinterpret some texts in an Australian key. An Episcopal (Anglican) site has an outline for centring prayer in relation to creation. You could substitute a reading from Genesis to replace the Exodus reading suggested. The Earth Ministry site mentioned above also contains a large index of hymns associated with nature and environment themes. Praying with a text is a very different activity to studying it, though study can and often does lead to prayer. Studying a scripture text implies an active effort to understand and interpret it, while praying a scriptural text invites us to ‘surrender’ to it, allowing it to penetrate at a deeper level than the cognitive alone. See the section headed Praying with Scripture in the Core Resources on the front page of the Scripture module and also this article introducing Lectio Divina, a way of praying with scripture which might bring you into an entirely new relationship with the Creation narratives. Jesus himself frequently used images and comparisons drawn from his observation and appreciation of nature in his teaching. Christians down the ages have drawn inspiration from the natural world, including the early Irish abbot Kevin of Glendalough, the visionary medieval abbess Hildegard of Bingen, the patron saint of ecology Francis of Assisi, the scientist and man of faith, Galileo, recently exonerated by Pope John Paul II, the poet Gerard Manley Hopkins whose poetry reveals the depth of his feeling for creation and his perception of the mystery of God at the heart of the world, and the Jesuit palaeontologist, Teilhard De Chardin who spent his life in an effort to integrate the truths of faith with the truths of science. An interesting and‘in-depth interview on ABC Radio National discusses his ideas in some detail. In a different key C.S. Lewis, in one of his children’s novels The Magician’s Nephew recounts a creation story which contains echoes of the Genesis creation story. An essay on the Lewis website Into the Wardrobediscusses some of the differences and similarities. The Catholic Conservation Center contains all sorts of resources on conservation, ecology and creation. It is well prepared, easy to navigate and presents the church’s response to the created order very clearly. An article by Marjorie Keenan opens up one of the Pope’s statements on ecology, and includes an informal commentary on Genesis. Choose one of the people listed above to find out some more about how they felt about the created world, and how this affected their spirituality. Write some ‘haiku’ poetry around the topic of creation. Read and enjoy CS Lewis’s creation story in ‘The Magician’s Nephew’. Who is ‘God’ in Narnia? How does creation happen? What is the relationship between animals and people in Narnia? Compare the Narnia creation story with the Genesis 1 creation story. What points is Pope John Paul II making in his short statement Ecological Conversion? Check the art related to creation on the Textweek site and the American Library of Congress which has an online site entitled Beginnings which contains some fascinating objects and images relating to Creation Accounts and Depictions. The Israel Gallery contains a modern interpretation of the days of creation. Poetry and Song is a short site containing a couple of poetic responses to creation. The Earth Ministry page has a list of hymns and songs honouring creation. Poet’s Corner includes many responses to creation and the natural world. Search under headings like nature, beauty, seasons, etc. An Australian poetry portaloffers access to some local writing. Choose a ‘day’ of creation. Make a collage which includes favourite pictures, photo(s), poem/reflection/song lyrics based on this ‘day’ of creation. Choose one or two of the images of creation and comment on what they reveal about the artist’s response to the Genesis creation story(s). Who or what is depicted? What is it saying about creation? Using instruments and tape recordings and other sound effects make a creation ‘soundtrack’. Having read and studied the creation stories in Genesis which teach that the universe and all it contains is the intentional work of a loving God, and that human beings are created in the image of God and bear God’s likeness, what is my view of the world in which we live? What is my view of human beings? How do I relate to animals and the natural world? How do I understand the relationship between the sexes? How do I understand the relationship between God and human beings? What rights are mine in relation to creation? What responsibilities are mine in relation to creation?